And, today’s YA author in the spotlight is PAM MUÑOZ RYAN. Enjoy! AUTHOR: (information comes from the author’s website www.pammunozryan.com): Pam Muñoz Ryan has written over thirty books for young people, from picture books for the very young to young adult novels, including the award winning ESPERANZA RISING, BECOMING NAOMI LEÓN, RIDING FREEDOM, PAINT THE WIND, and THE DREAMER. She is the National Education Association´s Author recipient of the Civil and Human Rights Award, the Virginia Hamilton Award for Multicultural Literature, and is twice the recipient of the Willa Cather Literary Award for writing. She was born and raised in Bakersfield, California, (formerly Pam Bell), received her bachelor’s and master’s degrees at San Diego State University, and now lives in North San Diego County with her family. FROM THE BOOK JACKET: Esperanza believed her life would be wonderful forever. She would always live on her family’s ranch in Mexico. She would always have fancy dresses and a beautiful home filled with servants. Papa and Abuelita would always be with her. But a sudden tragedy shatters her world and forces Esperanza and Mama to flee to California, where they settle in a camp for Mexican migrant workers. Esperanza isn’t ready for the hard labor, financial struggles brought on by the Great Depression, and lack of acceptance she now faces. When Mama gets sick, and a strike for better working conditions threatens to uproot their new life, Esperanza must find a way to rise above her difficult circumstances–because Mama’s life and her own depend on it. MY TWO CENTS: This novel was on my to-read list for a long time. The teachers at my former school read it with their 6th graders, and I had heard a lot about it, but I never got around to reading it myself. I’m glad I finally did. I listened to the audio version of the novel, which can sometimes make or break my experience. The reader was great, and the story was both beautifully written and touching. Muñoz Ryan’s writing has a lyrical quality and her characters are likeable and memorable. The story of Esperanza’s family losing everything and needing to start over was skillfully blended with the historical setting, the Great Depression. Esperanza’s relationship with her mother, her love of the land–a seed planted by her father–and the lovely portrayal of Mexican culture were all high points for me. 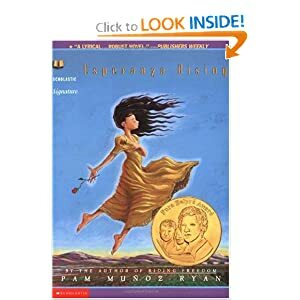 Find ESPERANZA RISING on Amazon.com and Goodreads. NEXT UP: The long list of YA novels written by Hispanic authors.